Disney has added two more light cycles to their collection of 3D Tron papercraft! 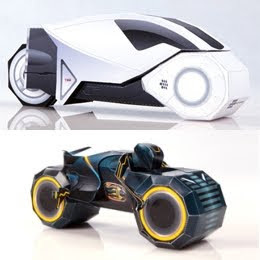 On top is Kevin Flynn's personal light cycle, said in the Tron: Legacy movie to be "the fastest on the grid". Below that is the light cycle belonging to Flynn's archenemy, CLU. The templates for the light cycles may be downloaded here and here. Previous official Tron papercraft by Disney included Sam Flynn's light cycle and a recognizer. If you have been waiting for the next release of the Half-Life 2 HEV suit papercraft I have been working on... the wait is over! ^^ This is the third release of the series. I have one, maybe two, more releases to go before the suit is complete. 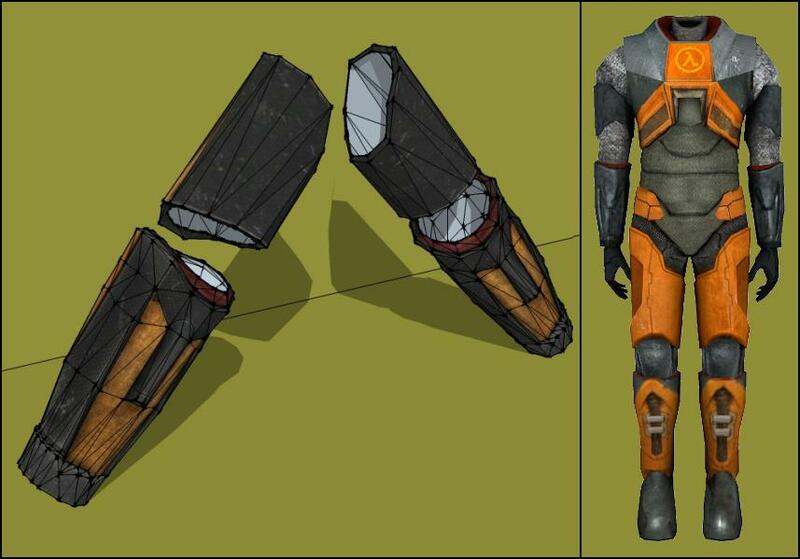 The template for this arm armor may be downloaded here. Here are a couple of simple Digimon papercraft by Chrono-fox at DeviantART. 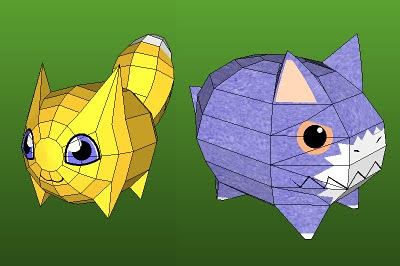 On the left is Viximon and on the right is Dorimon. Viximon is the in-training form of Renamon. Dorimon is the in-training form of Dorumon. Downloads of the papercraft templates for both of these are available here (Pepakua PDO format only). You've heard of the three wisemen, but never the fourth. See, he didn't do so well as far as a gift-giving went. Instead of gold, frankincense or myrrh, he stopped at the dollar store for coal. Let's just say that a very special baby in a manger was not so impressed. The simple, one piece template for this goofy fellow may be downloaded here. 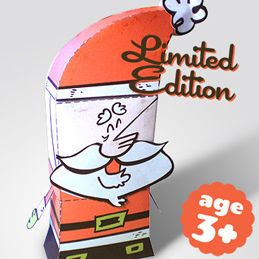 This limited edition Santa Claus paper toy is being offered by the Mister Black Tee t-shirt company during the 2010 holiday season. The style of this Santa matches the company's trademark t-shirt graphics. Also available is a paper toy of the company's logo which looks a whole lot like Mr. T. ^^ Both toys are available here. According to the instructions for this Christmas ornament papercraft, this winged reindeer is none other than Comet, one of Santa's eight reindeer. Ohh, so that's how they fly! 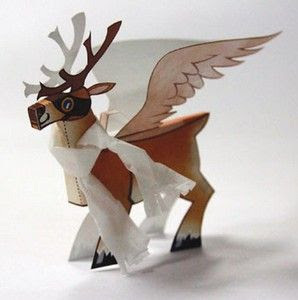 ;) This papercraft reindeer was created by artist Shane McDermott for the 2009 holiday season and may be downloaded here. 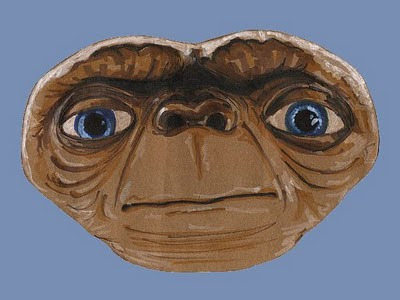 I think this mask of E.T. the Extra-Terrestial is exceptionally well done for having been drawn with markers on brown construction paper. Creator Kevin Gritzke used the mask as part of a costume back in 2007. The mask can be downloaded from Gritzke's Flickr page here. The new Tron: Legacy movie will be released tomorrow in the US! 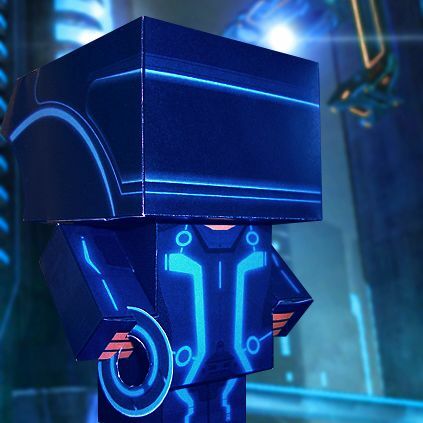 Here's a custom Tron cubee by randyfivesix at DeviantART. Although not labeled as such, it presumably represents Sam Flynn dressed in his arena battle gear. Sam Flynn is the main character in Tron: Legacy. The template for the cubee is available here. I don't make a point of doing posts on origami, but occasionally a piece captures my fancy. Such is the case with this piece. This skull and crossbones was folded from a single square of paper. 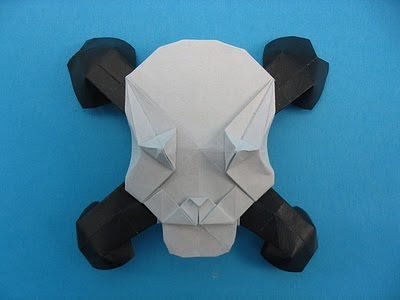 The paper is black on one side, white on the other, and folded carefully so that the skull shows white while the crossbones show black. Folding diagrams by Quentin Origami are available here. The B-wing starfighter first made its appearance in the Battle of Endor scene in Star Wars Episode 6, Return of the Jedi. 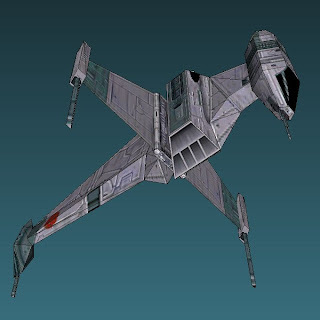 StarWars.com describes the B-wing as "perhaps the oddest-looking starfighter in the Rebel Alliance". The template for this papercraft B-wing by Czech designer Goozi is available here (Pepakura PDO format only). I built these KH2 papercraft just for fun. They are the card and die form the character Sora becomes when he loses to certain attacks by Luxord, the Gambler of Fate. Even though Sora is transformed into only a single die in the game, I went ahead and created two dice (not that you could actually use them in any kind of board game). The 3D model the dice are based on has unequal sides which probably throws off the randomness of their rolls. 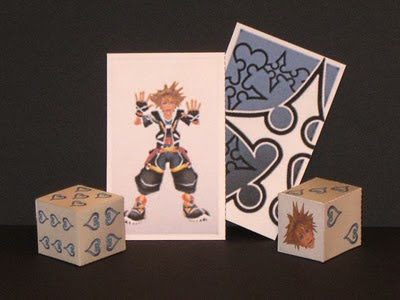 The card form Sora is sized to match real playing cards. The back of the card has Nobody symbols and matches Luxord's Fair Game weapon. The front of the card has a low resolution image of Sora (the game developers must have decided not to use a higher resolution image since the card appears only briefly and at a distance in the game). A download of the card and dice template is available here. These are a couple of photos of my Tron papercraft designs built by DeviantART members. On the left is my full size Tron helmet papercraft built by supermagicfunguy. 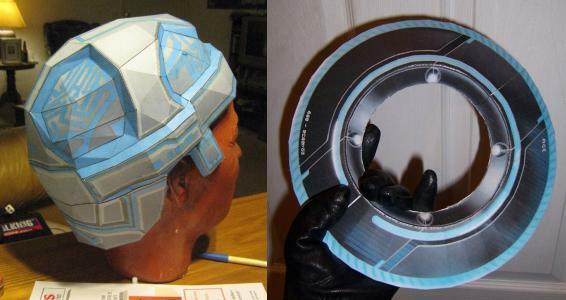 On the right is my Tron Legacy identity disc papercraft built by MasqueradeLover. This was MasqueradeLover's first papercraft build ever. Not an easy first build, but she did a great job! Nice work guys! Here is an awesome Chibiterasu papercraft by Lyrin-83, one of the most talented papercrafters on DeviantART (in my humble opinion ^^). 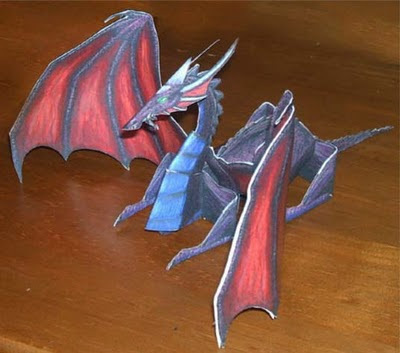 Lyrin created the 3D model and the textures for the papercraft template all "from scratch" rather than using a 3D model extracted from a video game. 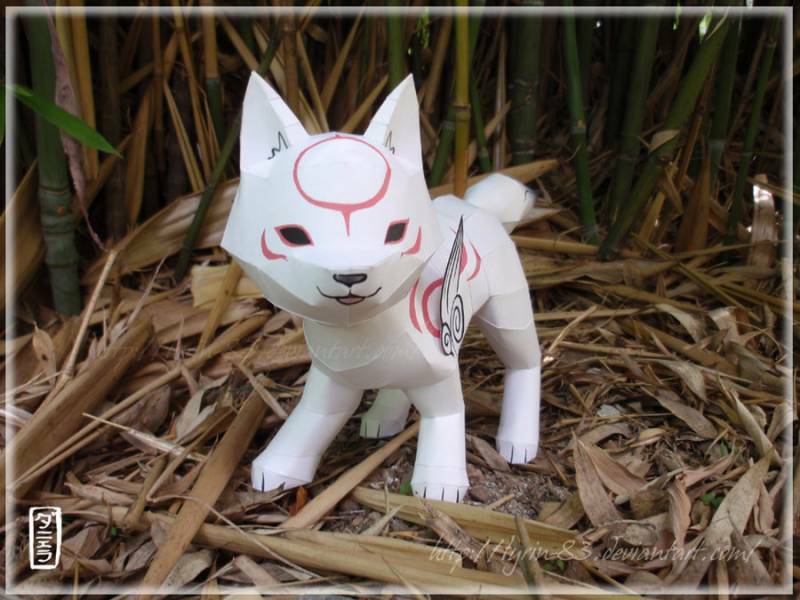 Chibiterasu is the young wolf from the Nintendo DS game Okamiden which is a sequel to the Playstation 2 and Wii game, Okami. Lyrin has provided a link to the template for this paper model here. Ron Caudillo is a well known designer of science fiction paper models. 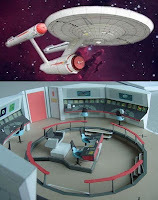 His Star Trek TOS models of the USS Enterprise and its bridge have delighted Trek fans since 2003. 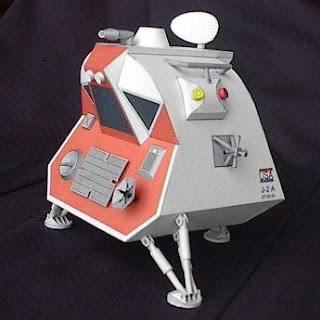 Less well known perhaps is his papercraft model of the landing pod from the 1960's t elevision show, Lost in Space. The pod was introduced in the third season of the show as a means to transport the crew of the Jupiter 2 spaceship down to the surface of alien planets. Pendercrafts.com has made the template for the LIS pod available in a zip file. The zip file also includes numerous Caudillo designs including paper models of: military vehicles, several BattleBots, a bus, puzzle cubes, a few office machines, as well as the aforementioned Star Trek models. Look for the download link at the bottom of the page here. This paper model of a Victorian Era water tower in Vienna, Austria is uncommon for an architecture papercraft in that its template is hand drawn. 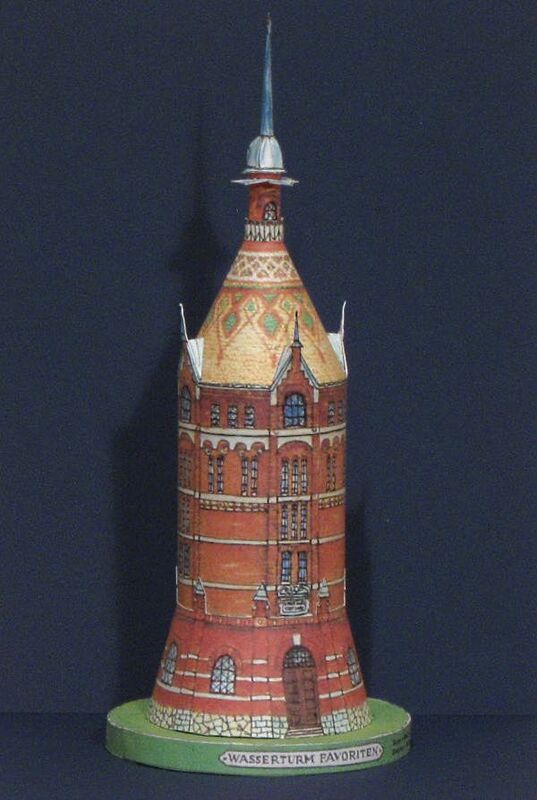 The ornate brick tower, located in the Favoriten District of Vienna, was finished in 1899. The building was closed in 1956, but a late 80's renovation gave the tower new life as a museum and cultural venue. The details of the paper model are somewhat simplified when compared with the actual building, but the finished papercraft still has a nice look. The four page template for the "Wasserturm Favoriten" can be found here. 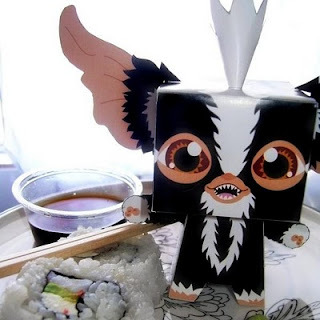 DeviantART member Sercho05 has created another Gremlins paper toy. 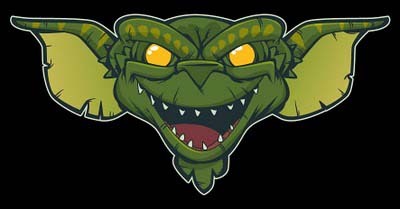 This time the character is Mohawk, the leader of the evil gremlins from the 1990 Gremlins 2 movie. Sercho has the template for Mohawk posted here. 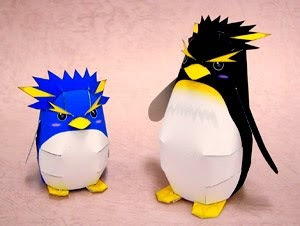 These papercraft rockhopper penguins look a little grumpy. Maybe they are upset about being on the endangered species list. ;) There are several different species of rockhopper penguins, which are also called "crested penguins" (for obvious reason). These papercraft ones look most like the northern rockhopper penguin species. The templates for the two penguins are available for download here. 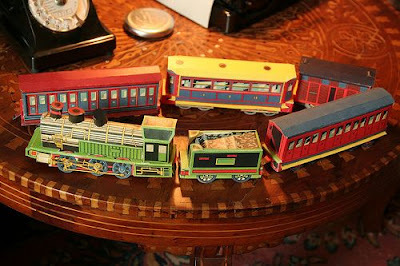 I couldn't find out much about the origin of this French antique papercraft train, but the style of the graphics have a definite 1930's flavor. The first page of the pattern for this locomotive announces that it is a "a real toy" with "easy assembly" and "no glue required". The picture above is a build photo by Patricia M. who runs the Agence Eureka blog. Patricia has the complete template for the train posted here. This deformed car paper toy is a custom design by illustrator Rory Phillips using the car template at the Portland Paper City website. The car is labeled "Pontiac" on the side, but I am unsure what model or year of Pontiac it might be. My guess is it's a Pontiac Catalina from the early 60's or perhaps a conglomeration of several different cars. Rory's template for the car may be downloaded here. 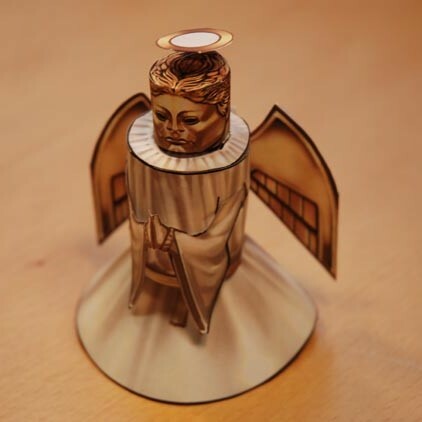 In 2007, the BBC offered a free download of a papercraft Doctor Who Christmas ornament. 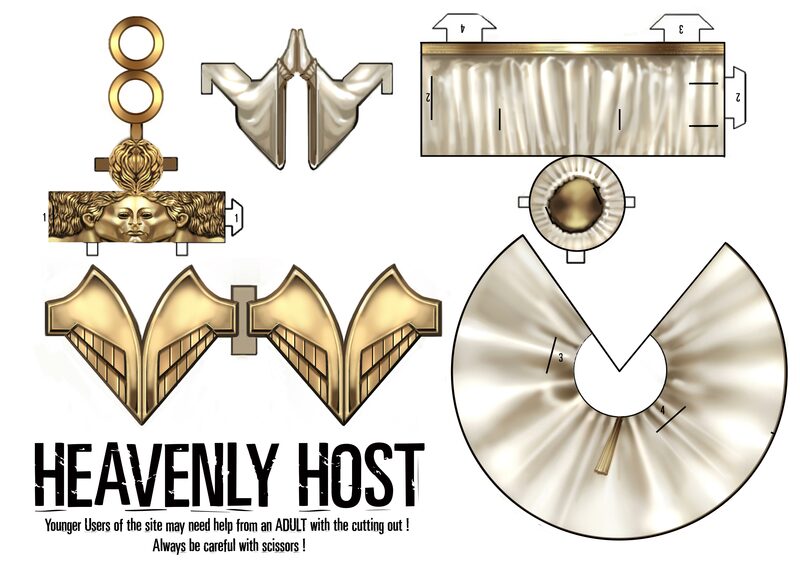 The ornament is of one of the angelic looking service robots known as the "Heavenly Host" from the Doctor Who episode entitled Voyage of the Damned. Despite their "holy" appearance, the robots can be deadly, their halos being used as throwing weapons. A download of the template for the ornament is still available here. Unlike the previous identity discs I did, which were 1:2 scale, this identity disc is full size. Although the disc may look pretty simple, but it is actually a fairly difficult build. There are two templates in the download, one with folding guide lines and one without. In the photo is my test build of the unlined template built without any folds. 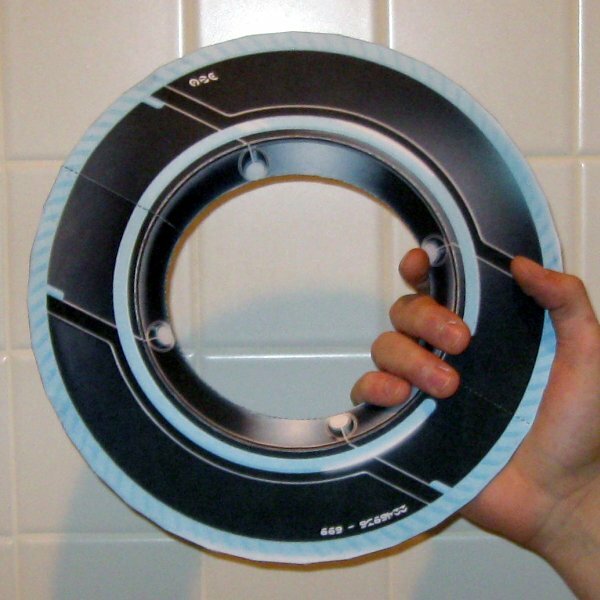 If the disc is built with folds I would give the difficulty level a 4 out of 5. Building without folds, I would give it a difficulty level of 5 out of 5! 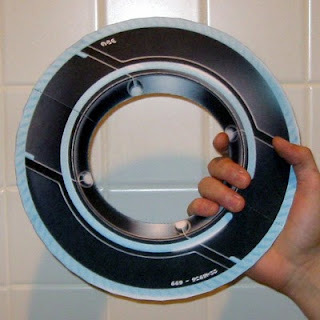 The finished disc is 10" (25 cm) across and 1" (2.5 cm) thick at the widest part. The PDF templates for the disc are available here. At the request of a couple of visitors, I have added two more ways to follow Tektonten Papercraft. First, e-mail subscriptions are now offered. Sign up, and an e-mail will be sent to you each time there is a new blog post on Tektonten. Secondly, we are now on Facebook. 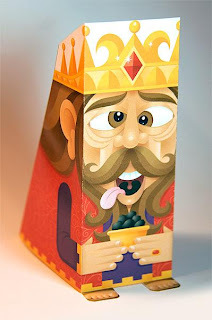 When you "like" Tektonten Papercraft on Facebook you will receive updates on your Facebook news feed for each new blog post. In addition, on Facebook I will be posting information about my papercraft works in progress (this information is not available any other place!) If you would like to take advantage of either of these new options, look for the links in the right hand column. Thanks! A Brazilian website has six different Volkswagen papercraft available for download. Three of the paper models are of the Golf, Volkswagen's small family car which has been produced since 1974. The other three models are of Volkswagen Type 2 microbuses with skylight windows on their roofs. Each of the paper cars has a different paint scheme. Mass Effect 2 is a relatively new video game released in January 2010. It is a futuristic action role playing game set in the year 2183. 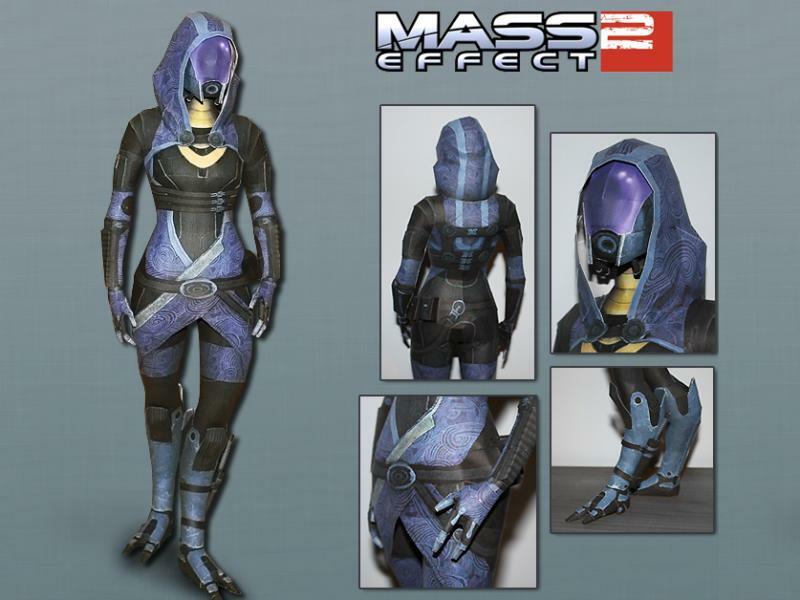 This papercraft based on a 3D model from the game is of a female character whose full name is Tali'Zorah nar Rayya. Tali is a Quarian, a nomadic species of humanoid aliens. Of the two papercraft I have seen of this character, I think this one is the better of the two due to its more relaxed, natural pose. The creator of this model is DeviantART member Xenonray (who also runs the Hyrule Papercraft blog). A free download of the template is available here. 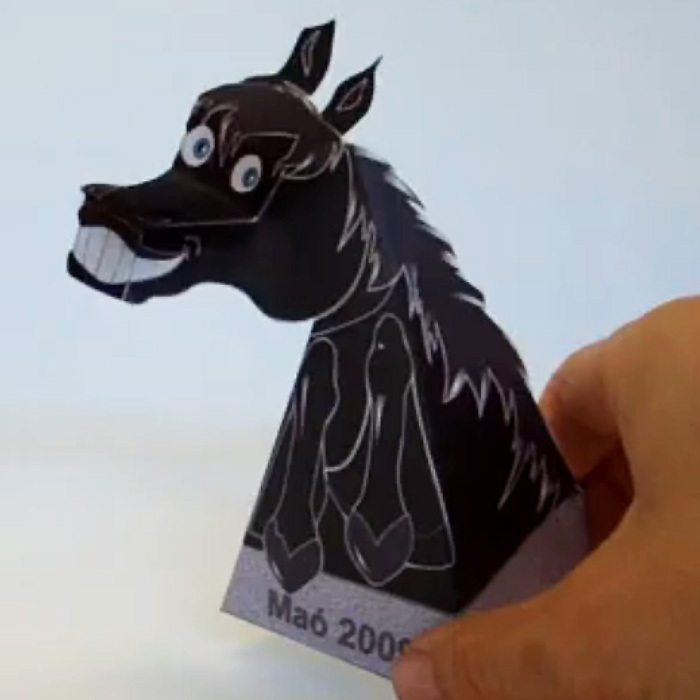 Here is a horse to add to your collection of illusion papercraft animals. 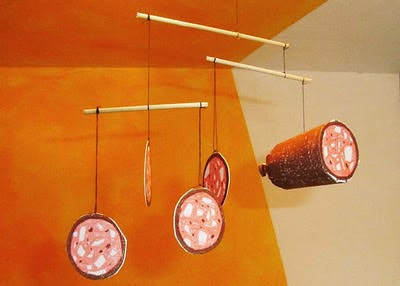 ^^ This illusion was created by the OSA-IFISC Student Chapter for a 2009 Science Fair on Menorca Island, Spain. OSA-IFISC Student chapter members are Ph.D. students with a common interest in optics. If you are not familiar with this type of paper model, it creates an optical illusion as you move about the room that the head and eyes of the animal are following you. The template for the horse is located here. 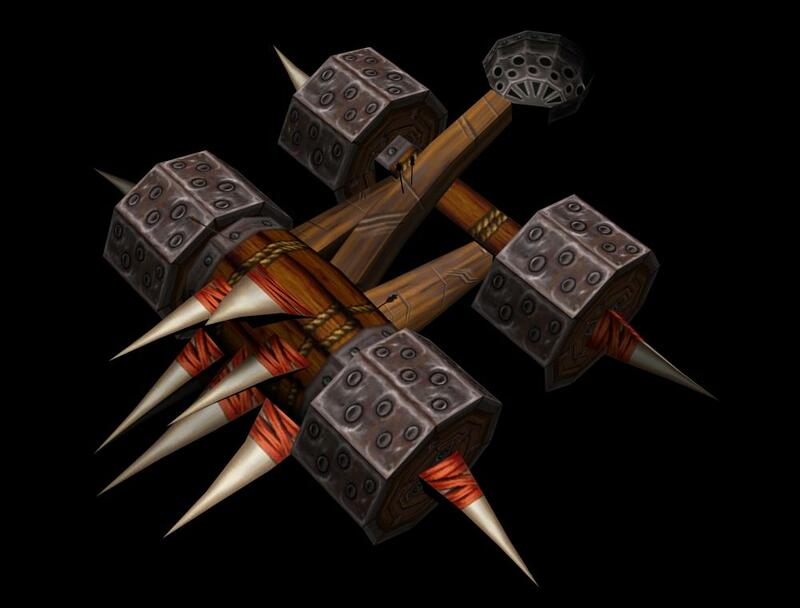 If I am not mistaken, this WoW papercraft is a catapult of the orc clan known as Dragonmaw. At only 4" (11 cm) tall, the model might be small enough to be used as miniature gaming prop. The template for the catapult was created by Freddy Patzi of Bolivia and may be downloaded here. What papercraft is coming in year three? I hope to do some more Tron and Kingdom Hearts papercraft as well as branch out into some Star Wars papercraft. Here is a heartfelt "thanks" to everyone who continues to support my blog. I couldn't do it without you! 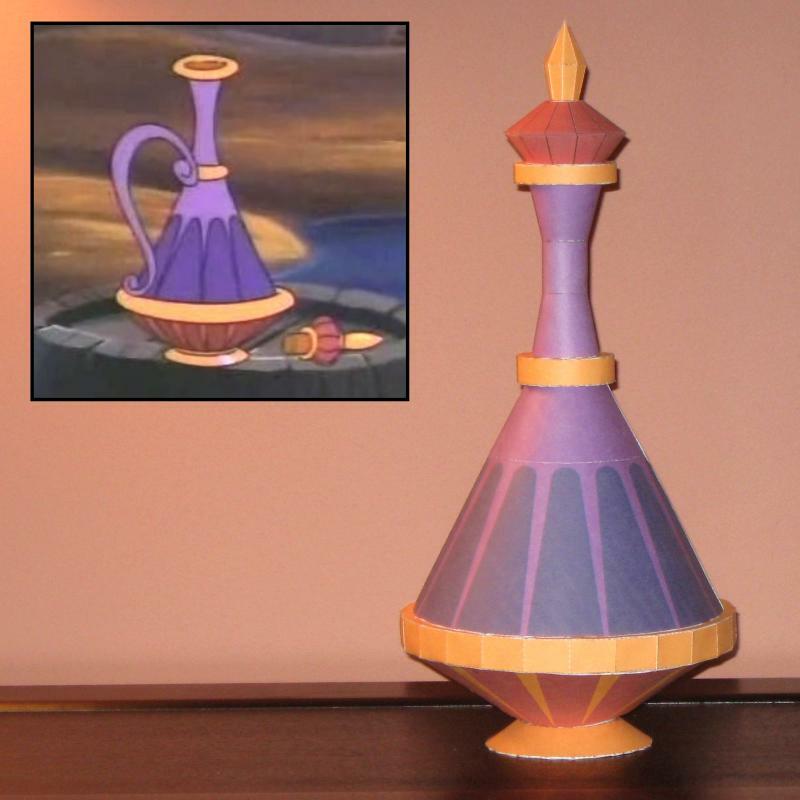 I made this genie bottle papercraft as a favor to my DeviantART friend, Fractaljinn. 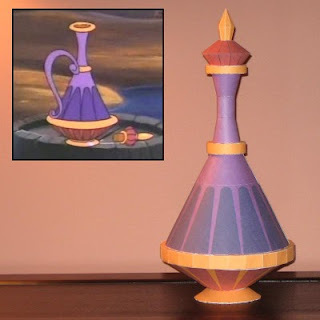 Fractaljinn wanted a papercraft model of the bottle of a female genie named Eden who is a character in the Aladdin animated television series by Disney. The series ran from 1994 to 1995. 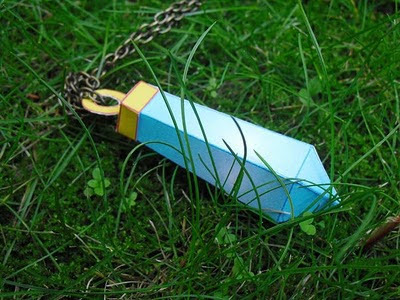 You may notice that the papercraft bottle doesn't have a handle like the one in the image from the TV show. Although a handle is included as part of the template, I sort of liked the way the bottle looked without it, so I didn't attach it when I did my test build. As a convenience to Fractaljinn who resides in Europe, the template was created for A4 size paper, so if you are printing on US Letter size paper you will need to use the "scale to fit" option. If printing on A4 paper, the finished bottle is roughly 40cm (15.75") tall. Another feature of the bottle is that the stopper is removable. Because the majority of the construction of the bottle is done by curving pieces of card stock, I give this a difficulty level of 4 out of 5. The PDF template for the bottle may be downloaded here. Aston Martin made its return to international racing in 2005 with the DBR9. The return was a success with the DBR9 winning its debut race. 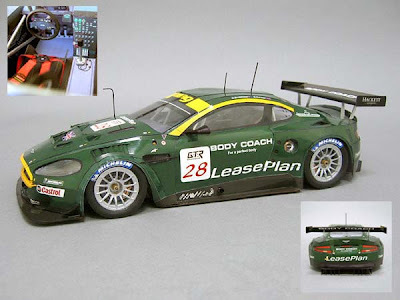 In 2006 Milos Harant designed this finely detailed 1:18 scale paper model of the 2005 DBR9. A download of the template and instructions for the building the model are available here. Also available is a template of the 2008 racing season DBR9 which has a light blue rather than green color scheme. 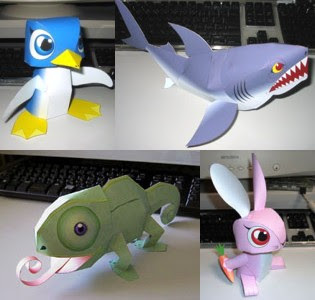 Here are some super cute papercraft animals by Japanese designer Ryo Tokisato. You gotta love them! In addition to the penguin, shark, chameleon, and rabbit shown here, there are also available a fox, a boar, a sperm whale, mice (in six different colors), and two different cows. The PDF templates for each of these may be downloaded at Tokisato's web page here. Once at the web page, click on the photo of the animal to download the template. DeviantART artist "Technoscream" specializes in 3D renderings and animations of mechas. 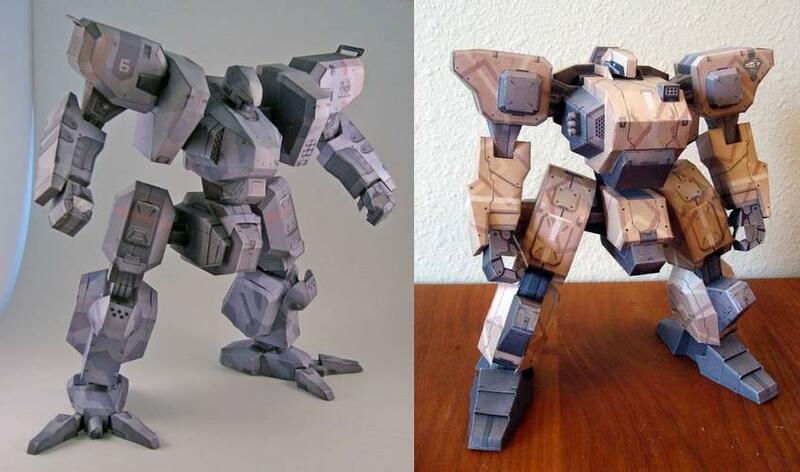 This Stalwart Robotic Missile Tank paper model is his first venture into papercraft design. 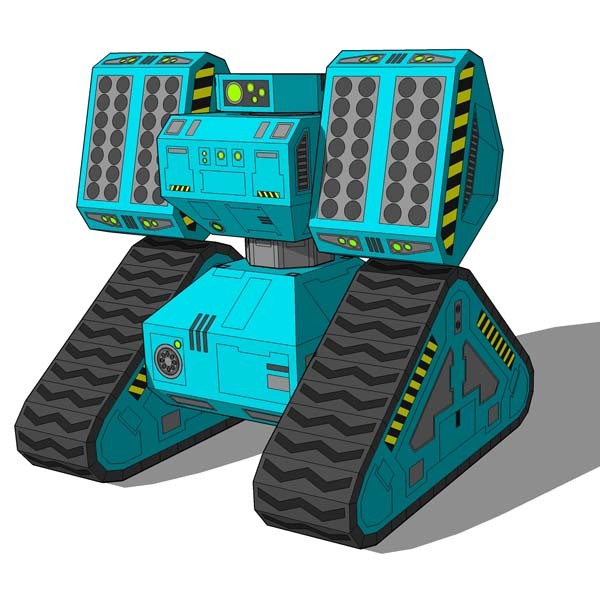 The description of this mecha indicates it is encased in thick armor plating and armed with two missile pods and a hull mounted minigun. The finished papercraft is only around 2 3/4" (7 cm) tall. The template contains five different colored tanks and may downloaded here. UK illustrator Adam Steel has created a paper toy template which he calls "Tiny McDoodies". 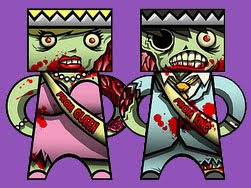 Adam has created several paper toy characters using his template, but my favorites to date are his Zombie Prom Queen and King (perfect for Halloween!) Downloads of the zombie toys are available here. Other paper toys available for download include a roller derby diva and a Russian sailor. Here is a little something I put together for the 2010 Halloween season. 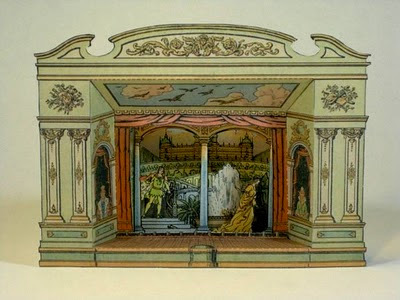 This 3D papercraft diorama was originally printed on the back of the 1973 Halloween edition of DC Comics' House of Mystery comic book. Scans of the diorama parts were posted on The Haunted Closet blog. I downloaded the scans, scaled them, and put them in PDF format to make the table top diorama easier to print and build. 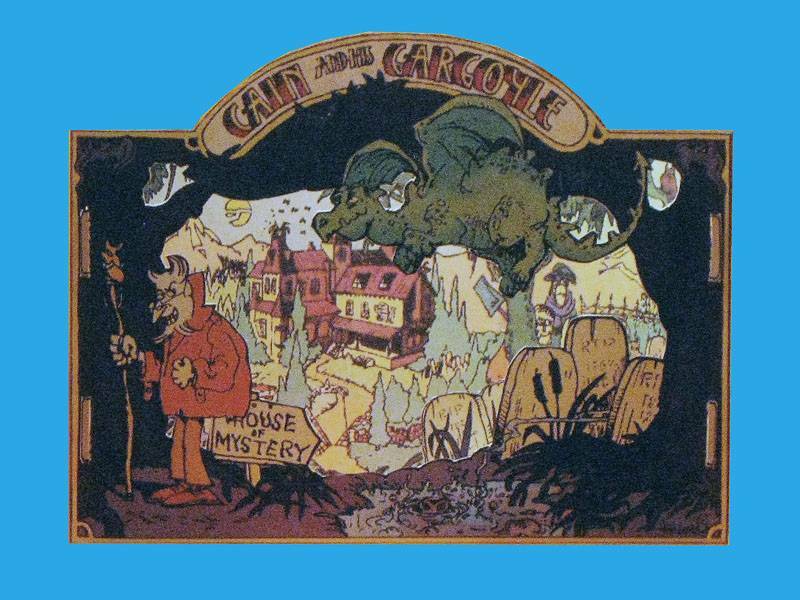 The foreground of the diorama shows Cain (the host of the comic book) and his pet gargoyle, Gregory. In the background are some grave diggers and the House of Mystery itself. The style of the artwork may look familiar as it was done by well known comic artist Sergio Aragones of Mad Magazine and Groo the Wanderer fame. 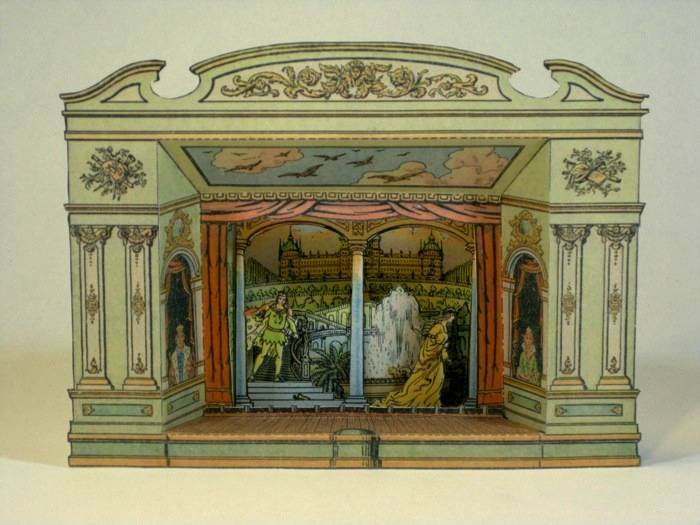 I have made my PDF of the diorama available for download here. Happy Halloween! The comedy horror movie Gremlins gave many a child nightmares in the 80's. Now thanks to UK illustrator Nik Holmes you can make your own cartoonish mask of the movie's troublesome little monsters. The two page printable template for the mask is available at Holmes' blog here. This papercraft dragon was designed by Jordan Peacock, the same designer who brought us the Alice in Wonderland Chess Set. This type of model is what Jordan calls "figure flats" which are simple fold-over paper models meant to serve in the place of the more expensive painted miniatures used in role playing games. In other places I have seen papercraft of this kind referred to as a "2 1/2 D" model, which I think is a good way to describe a 3D paper construction that is built of mostly flat pieces. A PDF template containing five different colored dragons and may be downloaded here, just click on the image near the bottom of the page to the left of the heading that reads: "MORE Sundered Skies Free Figure Flats: Dragon Models". The official website of Nissan Japan offers downloads of seventeen different paper model vehicles. Residents of the US will be familiar with some of the cars such as the Cube and the Murano (top row in the photo). However, other cars such as the Kix and the Otti (bottom row in the photo) are virtually unknown in the American market. 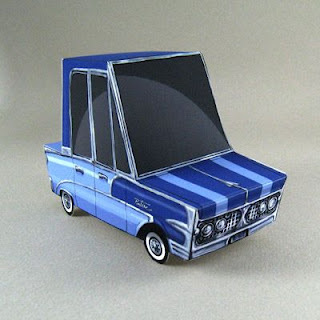 Downloads of all seventeen paper car templates are available here in both PDF and GIF formats. 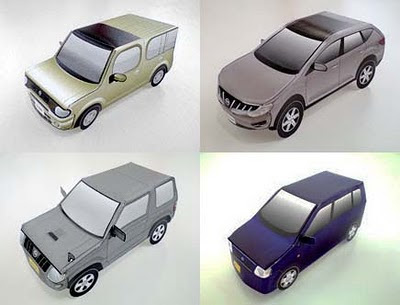 In addition to the cars pictured above, there are also templates available for a Fairlady Z, a Teana, a Skyline, and the unusual Pivo 2 concept car. Sweet and Sour Grapes is an online comic that tells the story of the friendship between a jungle dwelling girl and the ghost of a engineer from an ancient civilization. 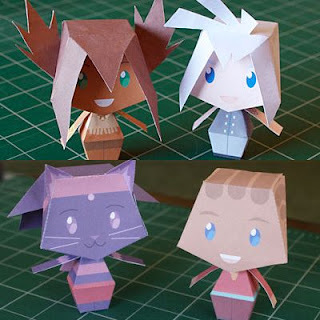 Diana Stoneman who produces the comic has created paper toys of several of the comic's characters. The aforementioned jungle girl and ghost are the top two toys in the photo above. To download these cuties and also learn more about Sweet and Sour Grapes take a look here. In the archives of the Germanic Museum in Nuremberg there is a Renaissance wood engraving that is thought to be the earliest paper model template ever created. The engraving was produced around 1529 by Georg Hartmann (1489 - 1564), a mathematician and designer of scientific instruments. When the template in the engraving is assembled it becomes a crucifix that also ingeniously functions as a sundial (the shadow in the photo on the right is at 11 o'clock). There are numerous images on the crucifix. On the front is an engraving of the crucifixion of Christ that is very similar to a 1489 woodcut print by artist Albert Durer (1471 - 1528). Some sources suggest that Hartmann was a pupil of Durer's, which might explain the similarity. On the back of the crucifix is a bronze serpent on a cross and an image of Moses in reference to a miracle performed by Moses in Numbers 21:8-9. In the Gospel of John, Jesus Christ refers to Moses' miracle as a symbolic foreshadowing of his own crucifixion (John 3:14-15) thus explaining Hartmann's inclusion of the bronze serpent on the crucifix. 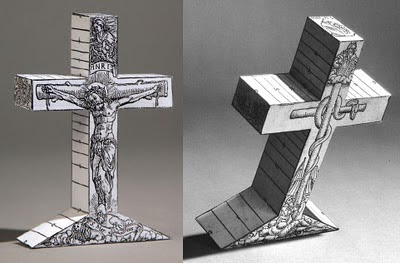 As far as I know there are no free papercraft templates of the crucifix, but reproductions may be purchased from several different European sources. One such source is here. Also on the same web page is a photo of the cross unfolded if you are curious. Sersa V over at the "SaveVersusDeath" Dungeons and Dragons blog created these Egyptian obelisk paper models for use as props with D&D miniature gaming figures. Officially titled "Obelisks of the Sun Kingdom", these monuments are easy one piece builds. I don't play Dungeons and Dragons so the best I could do for characters in the photo was to throw in some of my D&D version Heroscape figures. 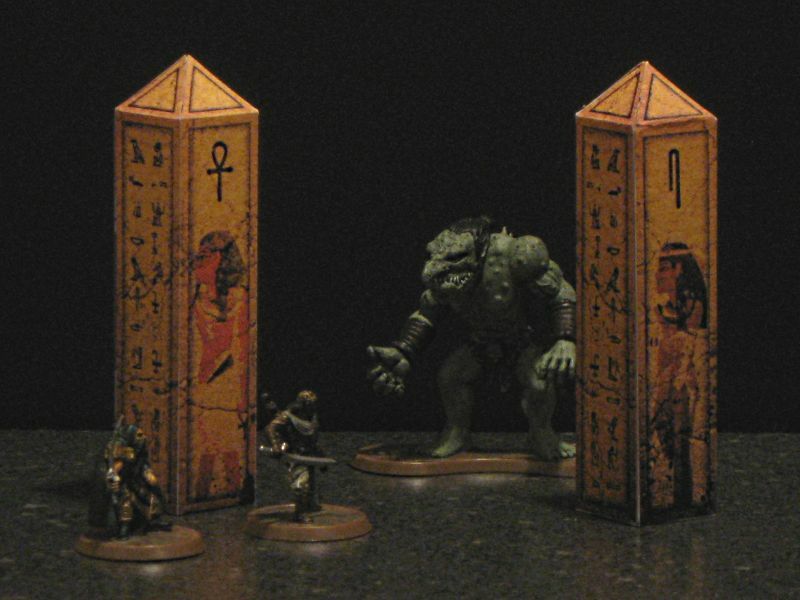 The template for the obelisks may be downloaded here. The extraterrestrial race of cyborgs known as the Daleks are considered by many to be Doctor Who's greatest enemy. The Dalek's battle cry of "Ex-ter-min-ate!" has been heard consistently on the good Doctor's sci fi television show since 1963. In the 60's and 70's Doctor Who's adventures appeared in comic strip form as well as on television. 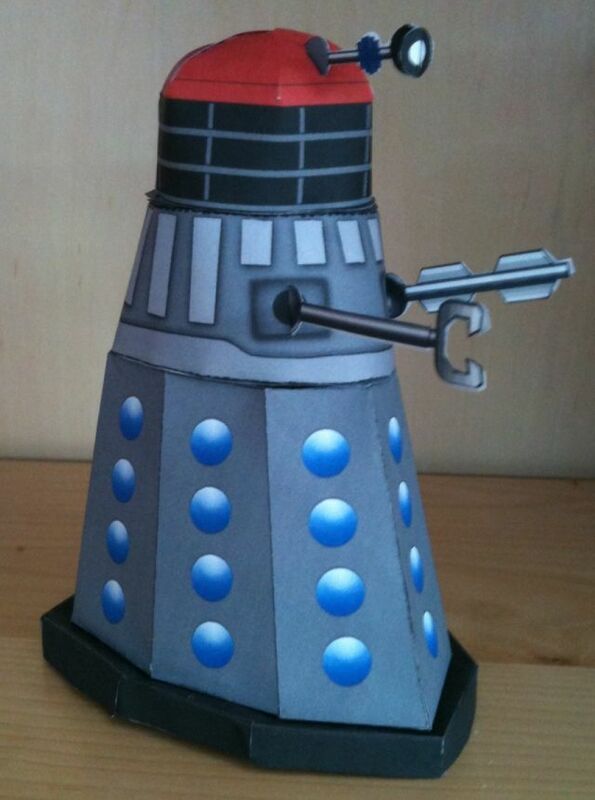 Pete D who runs a blog about the old Doctor Who comic strips created this papercraft Dalek based on their appearance in the comics.This particular Dalek is a red domed commander. The two part printable template for the Dalek is located here and here. 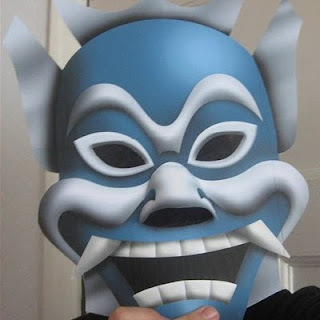 In the Avatar: The Last Airbender animated television show, in an episode entitled "The Blue Spirit", there is a mysterious character who wears a blue mask. This papercraft by deviantART member "Altenatecoppa" is a recreation of that mask. Even though there are some well done shading effects that make it look 3D, the mask is entirely flat except for the nose. A download of the template is available here. The build photo above is by deviantART member "Paperart". Around Halloween last year I released a series of seven papercraft Death Eater masks. I am adding an eighth mask to the set this year as I patiently wait for the Harry Potter and the Deathly Hallows movie to be released in November. :) As with the previous masks, there are both full size and half size templates available. Both sizes are included in the zip file which can be downloaded here. 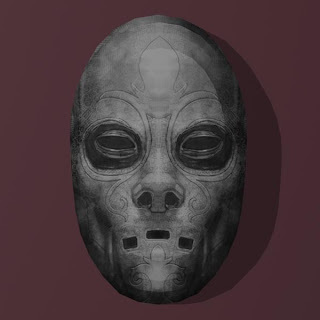 If you missed the previous Death Eater masks you can take a peek at them here. It is getting close to Halloween which means it's time for some spooky papercraft! These simple coffin treat boxes are offered by the folks at holiday-crafts-and-creations.com. 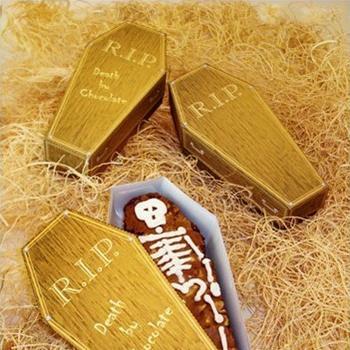 There are two different templates for the coffin lid, one with a "death by chocolate" slogan and one without. Also included are instructions on how to make skeleton brownie treats to go inside! Download links for everything you need to build these can be found here. These two World War II papercraft models are free samples offered by the commerical paper model company, Paper-Pro Modeling. Most of Paper-Pro's products are deformed models that don't require any glue to assemble. On the left is a British Supermarine Spitfire fighter plane and on the right is a German Panther tank. Look for the download links for these models on the right hand side of the page here. 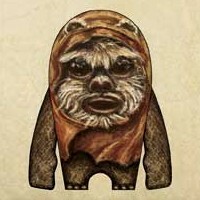 This painterly 3D Ewok paper toy is the work of Australian illustrator Ashlee Duggan. Ewoks first appeared in the Star Wars movie, Return of the Jedi. Duggan aptly describes Ewoks as: "a fictional species of teddy-bear-like hunter-gathers that inhabit the forest moon of Endor. They appear as stocky, sapient bipeds which stand about one meter tall." 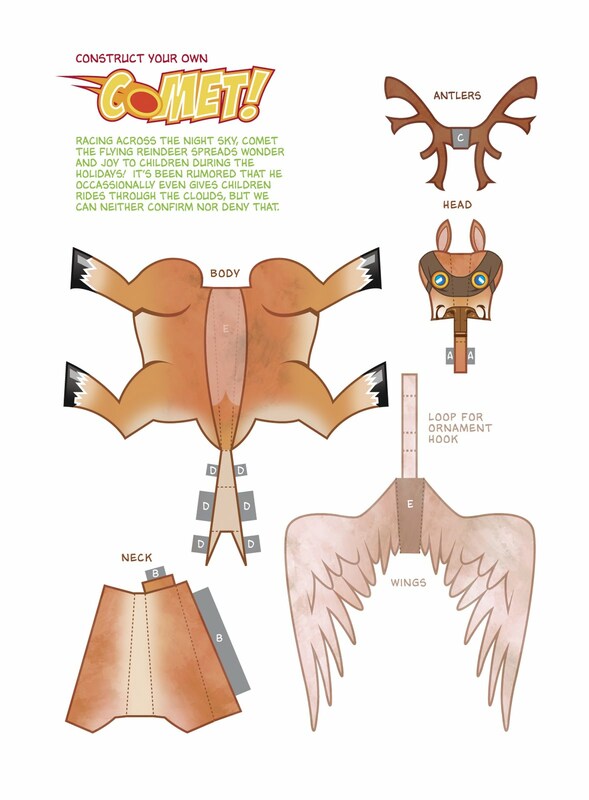 The single piece template for the Ewok paper toy may be downloaded here. Sometimes 2D papercraft can be just as much fun as 3D papercraft. Such is the case with this Alice in Wonderland chess set. 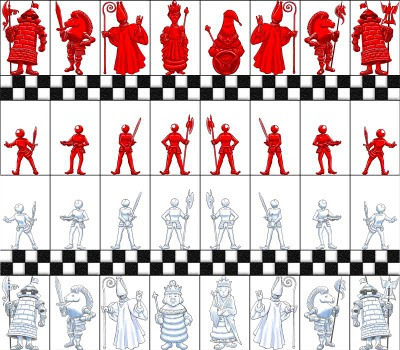 The two sided flat paper chess pieces in this set are based on the illustrations by Sir John Tenniel found in the original Alice in Wonderland book. 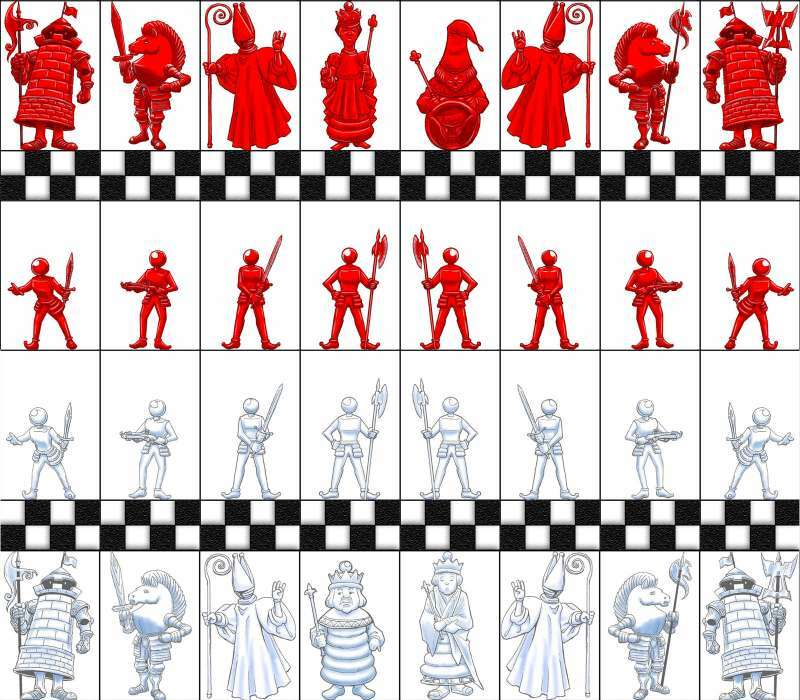 The game's PDF template designed by Jordan Peacock includes a printable chess board and may be downloaded here.